This game came to me courtesy of random-ize.com. I have a list of NES Games, and every once in a while I toss it in the randomizer to give me an idea of what to play next. 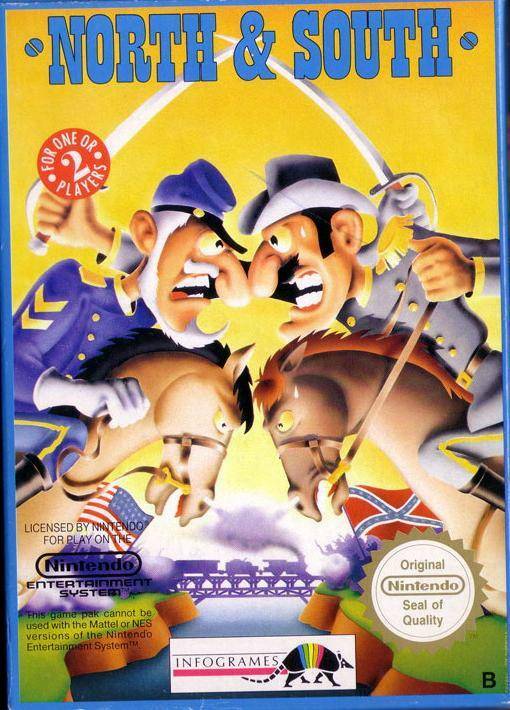 I’d never heard of north and south before, but one look at the box cover made this game pretty obvious. I’m not going to discuss the history because I don’t want to be lynched by any American History experts that may live in the same house as me – but the goal is the same for both sides, Win. 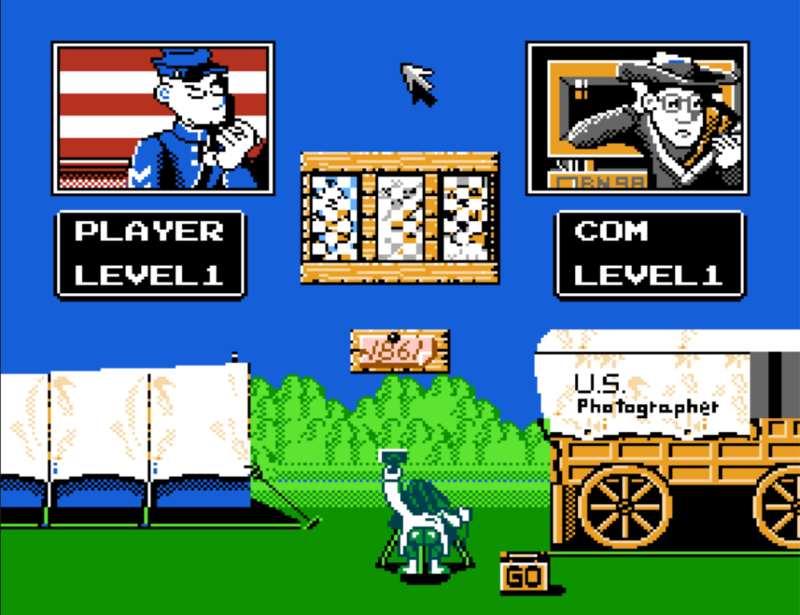 Setting up the game required the manual, two players on either side of the screen, and levels, and stuff in the middle, and dates. What did we do in the days before mouseovers and help tips? The general idea is you can play this human vs human or human vs computer. The pictures in the center control things that might happen during the game, Indians, storms and extra reinforcements. The date picker defines the starting armies and territories held by each player. 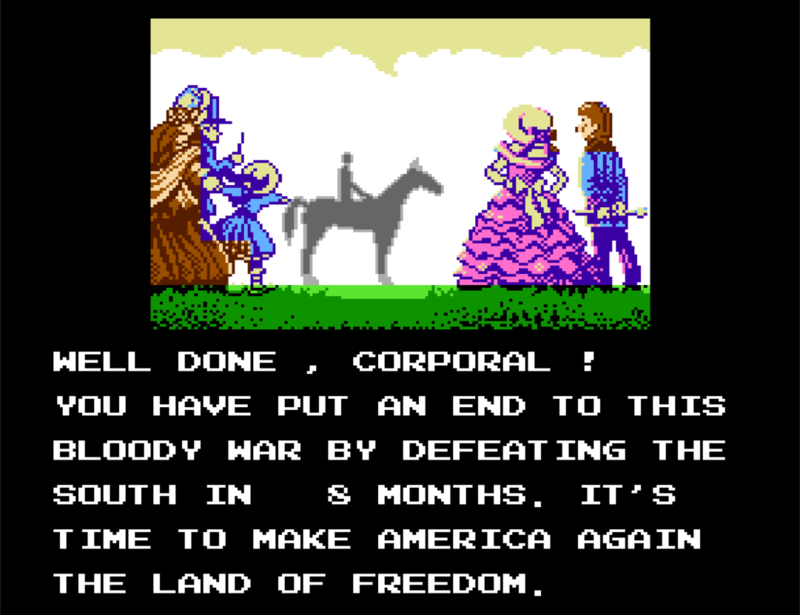 The game begins with a historical breakdown of what’s going on, then drops you right in to a terribly drawn map of the United States but only about half way across the country. Your armies are placed, and there is a railroad around the perimeter of the map. The overall goal appeared to be to take over the whole map while crushing the enemy. That’s the short of it, but there is more to the game than just moving your army around the map collecting states. 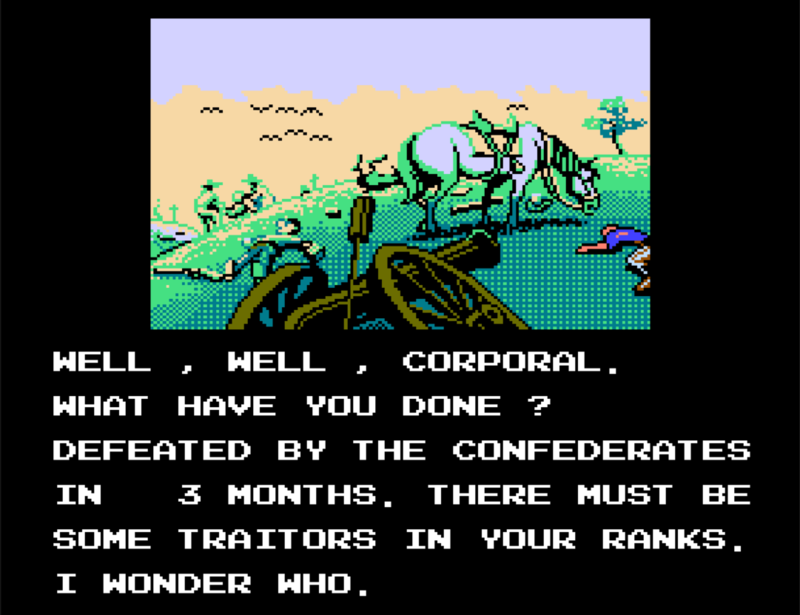 I lost my first game horribly, because I had no idea what the map, or troops meant, or how to fight in combat. It’s relatively straight forward, but how are you supposed to fight a computer that can control multiple things at the same time? In short, it’s not easy. I still haven’t determine a “fool proof” way to accomplish it. In general, you control your soldiers by selecting them, then moving them on the map. Hitting the action key attacks. For the cannon, you have to hold down to power up and depending on how much power you put in to it, that’s where the cannonball lands. Cavalry is fast, but you can’t stop them once they start. They attack with sabers, so have to be close range. Infantry has unlimited amount of pellets with a rapid reload speed. They are by far the most important units on the field. 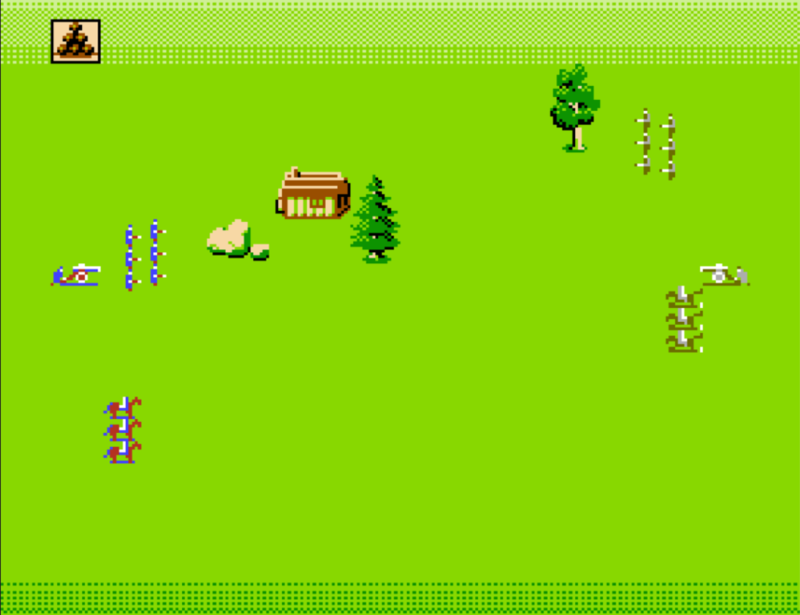 in addition to open field combat, there are forts spread around the map at the four corners of the railroad. These forts allow you to get supplies, control two connecting forts, and you will receive cash at the end of our turn ( 2 or 3 money bags). 5 money bags equates to a whole new battalion, so the money is quite important. To conquer a fort you enter a side scrolling adventure where you (a single suicidal hero) attempt to take the fort solo with four knives. The enemy has a limited number of soldiers to delay you, they can’t kill you, because you’re superman, but they can delay you long enough that you lose. I’m not sure how that works, but I didn’t make the rules. Enemy soldiers die by going off the screen, or being punched or hit with a knife. So conserve knives, and try to make them walk off the screen, it’s the most efficient way. You have tons of time to accomplish the capture, if you are patient and keep working your way forward it should be a piece of cake. Defending the fort is equally impossible. The only way I have accomplished it is by standing next to a hole and repeatedly knocking the attacker back as he tried to jump across. It took FOREVER. If you position your army in the path of the enemy train between two forts, you can similarly attempt to rob (or defend) it. This is even more difficult to defend because it’s much easier to hit the side of the screen as a defender. Successfully attacking the train is even easier than the fort. Winning the game only requires you to kill all the opposing armies, holding territory only makes the game easier by providing more cash for reinforcements, if you are good enough at the open field combat, smaller forces can take out much larger battalions. If you are less confident at the combat, you can combine your own forces to give you a bigger edge. 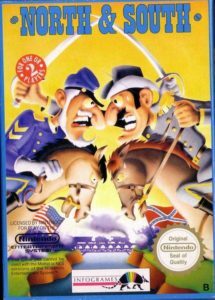 While each game presents unique challenges, this one didn’t hold my interest for long – the open field combat is difficult and not very rewarding. The side scrolling superman adventures are frustrating and impossible. Replayabilty, -1.